I’m sure there are already as many reviews about Christopher Nolan’s last movie about the battle of Dunkirk, as there were British soldiers on the beach of Dunkirk waiting for their evacuation. An awful lot. Although it wasn’t a battle in the strict sense of the word, but rather a massive logistical operation to get the English army back on British soil. Whether this operation had any influence on the course of the 2nd WO, is something for military strategists and analysts to determine. In my opinion, there was an incomprehensible blunder made by the German commanders. Fortunately, because sauerkraut isn’t really my favorite dish. It’s not a chapter in this terrible world war, with heroic battles taking place. A bold choice, but nevertheless, it was a breathtaking spectacle. By land, at sea and in the air. To call it “Film of the Year” is a bridge too far (you can call that flick a masterpiece). But Nolan succeeded in creating an energetic and exciting film that intertwines three different story lines in a non-chronological way. 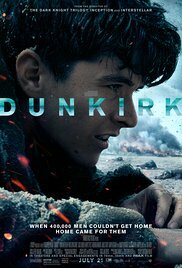 Tommy (Fionn Whitehead) is the key figure who must save his own skin from the beginning on, so he won’t be mowed down by German bullets. It seemed like the only thing he did the whole movie was surviving one life-threatening situation after the other. Then there’s Farrier (Tom Hardy), one of three Spitfire pilots who try to safeguard the crossing of their troops and hunt down fierce German fighter planes and bombers which are trying to sink as many ships as possible. And finally there’s Mr. Dawson (Mark Rylance) who’s crossing the canal in a simple yacht together with his sons Peter (Tom Glynn-Carney) and George (Barry Keoghan) to help with the rescue of soldiers. In this way Nolan incorporates three different chapters, each taking place in another territory. By land, at sea and in the air. The sound effects and musical score. The very first thing you’ll notice is the largely wordless acting. Particularly Tommy whose lips seem to be sealed almost throughout the complete movie. It is as if in this war every conversation seems useless and body language speaks volumes. The majority of dialogues are at the expense of pilots and commanders. Unfortunately, the conversation between Spitfire pilots is sometimes unclear and restricted to indistinct mumbling. Partly due to deafening noise effects (and when you are watching this movie in a Slovenian cinema where it’s hard to read the subtitles as well, this is a slight disadvantage). And that brings us to the soundtrack. It’s omnipresent and, in my opinion, of decisive importance. Hans Zimmer’s music seems to be constantly present and bolsters the entire film. At moments unobtrusive in the background after which it swells out into a climax. Let’s say that this is the very first time the musical setting demands my attention and impresses me. The same goes for the deafening noise effects, which sometimes make it seem like you’re in the midst of the war. The down diving Stuka’s and the deadly cargo they drop on the beach with that terrifying, screaming noise. Sometimes I had the urge to crawl deeper into my chair. You can taste the despair. The way everything is portrayed is also phenomenal. The dogfights are in my eyes the highlights in this impressive film. The vast shots of the beach where thousands of Allies are crammed as sardines in a barrel. You can feel the threat of dead. The claustrophobic and precarious situations that’ll make you feel as if you’re trapped yourself. The despair flows off the screen. Thousands of Allies can, as it were, practically see their safe home but they realize that getting there is an impossible matter. I’m sure it’ll win some prizes. This is, just like “Saving Private Ryan“, an epic war story. Only the first one was more brutal and showed the horror of WWII in a terrible way. That’s why I still can picture some scenes from this Spielberg spectacle. I’m afraid that won’t be the case when it comes to “Dunkirk“. The fact that it was a defeat that led to a victory afterwards is an indisputably fact. And yet, I had this “that’s-it?” feeling afterwards. Without a doubt, it was a traumatic experience for the thousands of Allies, but the compulsory cheering moment as apotheosis was a bit too predictable. And I’m still wondering why Farrier made that decision in the end. As reasoned as his previous actions were, so stupid I found this final decision. Obviously, “Dunkirk” will win prizes at the major film festivals, but I’m afraid the main prizes will be awarded to others. I hope they’ll release films the next six months that deserve the title “Film of the Year”.